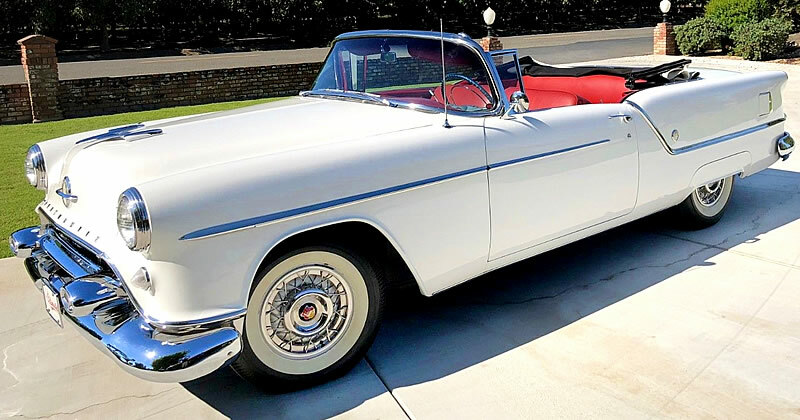 This 1954 Oldsmobile Super Eighty-Eight Convertible looks fabulous in its Polar White paint and is set off nicely with its striking red leather interior. Power comes from the original 324 cubic inch “Rocket” V8 engine with 4 barrel carburetor. She’s an automatic too, fitted with a Hydra-Matic transmission. Oldsmobile introduced a complete restyle in 1954 so this is a second generation Eighty-Eight and it lasted through to 1956. The Super was a step up from the standard Eighty-Eight and you could expect extras like; chrome rocker panel moldings, deck lid ornament and foam rubber seat cushions. There aren’t many of these around, our records tell us that Oldsmobile only made 6,452 Super Eighty-Eight Convertibles for 1954. Check out that beautiful dash! If you had ordered one when they were new the base price would have been around $2,615. 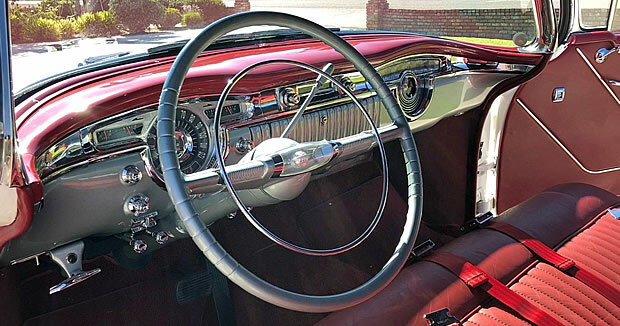 This was the year that a “safety” padded dash was now available – yours for just $17! 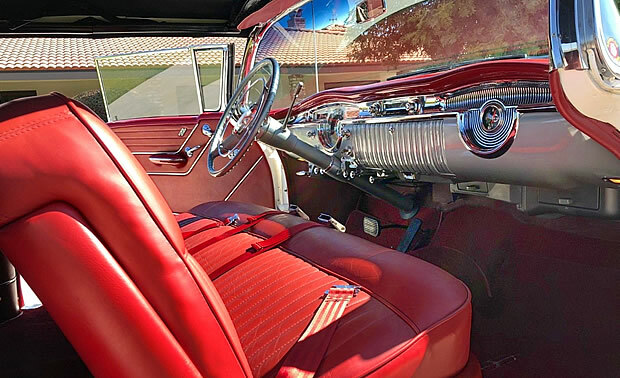 The convertibles came with power windows, power front seat and a power top as standard. Added to that, this car has power brakes (a $37 option) , power steering (a $125 option) and the Hydra-Matic Super Drive automatic transmission would have added a further $165 to the base price.